Forex Magnates is proud to present its Q2 Quarterly Industry Report (QIR), showcasing the most interesting details and analyzing the most important developments seen by the FX industry during the second quarter of 2014. The year so far has been a challenging period for traders and brokers in the financial markets. Continued geopolitical clashes in multiple strategic regions, harsh new FX regulations in various countries around the world and relatively low levels of volatility- all have lead to a somewhat stale market affecting the trader’s mood to trade, excitement & confidence. 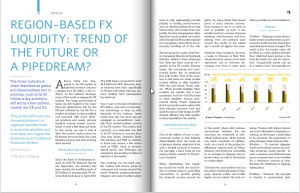 Aiding the various actors in the FX business to get a firm grasp on the changing world, Forex Magnates’ QIR2 2014 provides an in-depth examination of a wide range of issues which can be critical to the industry. From the regulatory developments in the FX markets of the U.K, Israel and New Zealand, to the new exotic markets of North Africa, we have got you covered. In addition, we have examined the costs and return on investment of human salespeople Vs. algorithmic machines. The report examines whether Tradable is to become the platform of the future or remain just a niche; weighed the effects of social marketing relative to conventional marketing strategies; looked at how brokers are diversifying in an increasingly challenging environment, and much more. To view a free sample of the digital version of the QIR2 2014 click here.